The Idaho State Liquor Division (ISLD) is the US government agency that controls the sale of all alcohol within the state of Idaho.After astonishing growth, the Idaho State Liquor Division (ISLD) warehouse and distribution center in Boise was bursting at the seams.The old way of managing their inventory was not working for them anymore and they had to find a new, more effective storage solution.The Interlake Mecalux unit load automated storage and retrieval system (AS/RS) [automated warehousing in the US] provided the storage they needed now and in the future. When the Idaho State Liquor Division moved into their new 5,110 m2 Boise distribution center in 1998, they were confident in the facility’s capacity to accommodate any increase in demand over the next few years. Higher population coupled with a consumer shift to premium liquor brought the ISLD to a point where they had to manage their inventory better or find a new, larger facility. Additional space was needed as suppliers frequently produced new or improved spirits. Moreover, with a growing number of liquor manufacturers, the number of spirits produced could grow exponentially. It was imperative to increase the storage capacity via an automated system that would allow them to improve the distribution and management efficiency. Although the ISLD team initially wanted to expand the warehouse outward with a uniform height ceiling, after seeing AS/RS pallet racking in action, they realized it was time to do something different and build up. A single solution stood out from the rest, the one from Interlake Mecalux (IKML).Three factors made IKML’s storage proposal the clear front-runner: the capability of the AS/RS system, the automated product management, and the price. The two teams worked side by side to design an AS/ RS that complemented the already existing warehouse operations. The newly installed pallet racking with stacker cranes supplied high-density storage in an even smaller footprint with room for many years of growth. The new AR/RS fully utilizes the 15.5 m high warehouse addition by adding nearly 2,800 more storage locations. In addition, this project not only fulfilled the expectations of the Idaho State Liquor Division in regards to pallet racking but also at a box picking level by optimizing processes related to the preparation of orders. Pallets are received at one of the facilities’ three docks and either taken directly to the new AS/RS or to the pallet racking storage for full case picking. For entry into the AS/RS pallet racking, lift trucks transport pallet loads to an induction station conveyor. Sensors within the station automatically weigh and measure each pallet. To improve safety and product security, pallets are also scanned to determine tolerance. Pallets that are loaded improperly or damaged are diverted for repair or adjustment. 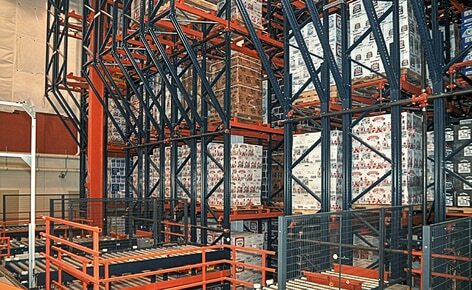 However, most pallets are deemed acceptable and conveyed to one of the three 49 m long aisles of the automated warehouse. Servicing each lane of the system is a high-speed, double-mast, double-deep stacker crane. The 15 m tall stacker cranes are automatically summoned to gather any pallets diverted to their lane for put away. Moving at speeds of nearly 3 m/second and lifting speeds of nearly 1.3 m/second, the cranes swiftly and securely place products in the double-deep rack. The movements of each crane are precisely controlled by Mecalux’s Galileo software ensuring the pallet arrives at the appropriate picking station. The primary output station is located near the case picking area. Full case picks are directed by a voice system and placed onto pallets. A secondary output station is located on the mezzanine level servicing split-case picking. When a stacker crane delivers a pallet to this station, a worker is given instructions on a computer screen to pick a required number of cartons. The cartons are removed from the pallet, labeled and placed onto the split-case conveyor supplied by IKML. Once the required boxes have been removed from the pallet, a stacker crane returns the pallet to the automated pallet racking for storage. Not only will the comprehensive system provide for future growth without needing to increase labor, but it will also increase the building’s safety, productivity and reduce product damage. The Mecalux Easy WMS warehouse management system is an information and management software that aims to optimize the physical and document management of the flow of products, from its entry into the warehouse to its dispatch, guaranteeing traceability. In the case of Idaho State Liquor Division, the Easy WMS controls the automated warehouse in order to improve throughput. Easy WMS receives orders given to it by the Enterprise Resource Planning System (ERP) of the customer, being permanently and bidirectionally connected. Meanwhile, Galileo is the management program running the movements of the stacker cranes ordered by the WMS, determining the exact moment when the stacker crane should stop or enter the racking. High-density storage: the new automated warehouse has enabled Idaho State Liquor Division to have more 2,800 pallet locations. Picking streamlined: the voice picking system gets each operator to remove the bottles corresponding to each order from the live racking and place them in the designated boxes. Total safety: automation eliminates errors caused by human intervention and ensures an improvement in the condition of the goods. Full product control: Easy Mecalux WMS system allows the Galileo management software to facilitate the movements of the stacker cranes, ensuring that each pallet arrives to the appropriate picking area.